*Author: Research and Education Association (COR) *Series Title: Super Reviews Study Guides *Publication Date: 2013/07/08 *Number of Pages: 284 *Binding Type: Paperback *Language: English *Depth: 0.75 *Width: 5.50 *Height: 8.25. There's no greater feeling than getting the perfect item with the most features at the lowest price. 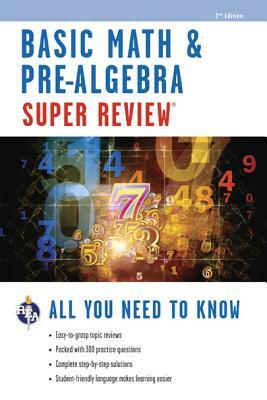 When you purchase this Basic Math & Pre-algebra Super Review By Editors Of Rea (EDT), you can be confident that you've found the best deal available online. Our everyday marked-down price is $10.87, $0.54 less than the retail price you'd pay at most stores. Want to save even more? Look for items marked FREE SHIPPING for free shipping within the continental United States. At UnbeatableSale.com, we guarantee you won't find any of our unique deals anywhere for less. If you do, we'll match that price before the order is placed.